This is probably the healthiest blog post ever. Autumn is most definitely in the air. 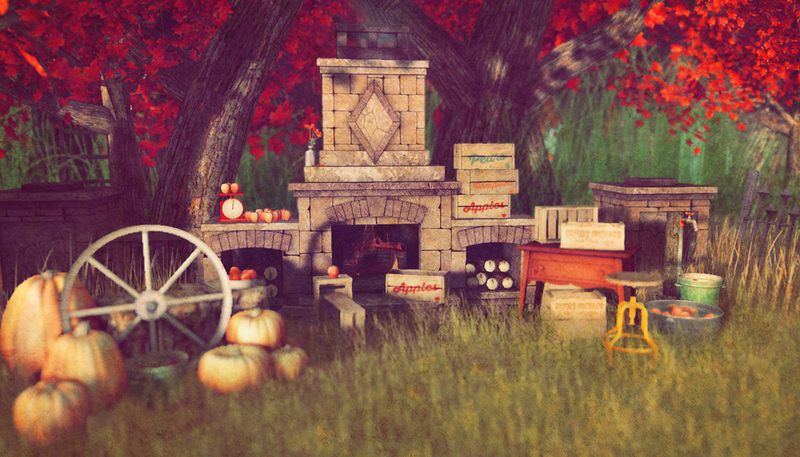 I've pulled together this lovely fall scene with beautiful new releases from all sorts of events currently happening: Collabor88, The Arcade, and The Seasons Story. It's a busy month, events-wise. That fireplace is from Cory Edo and Trompe Loeil -- the Dardon Stone Fireplace Kit that you can pick up at Collabor88. It comes as individual pieces so you can build the perfect fireplace and patio for your space. I think the fireplace by itself would be lovely inside, too, in a nice rustic lodge or cottage. Mostly all of the apples are from my music soulmate Tegan Serin and floorplan. She's got two adorable autumn sets out right now, one at Collabor88 and the other at Seasons Story. All you need to get into an apple pie frame of mind. Mmmmm, pie. Those amazingly realistic pumpkins are from Kaz Nayar and PILOT. Those really are gorgeous. The whole little set includes the pumpkins, the wagon wheel, and the hay bale. It's a great deco piece to dress up your space for the season. Check out all the events. ALL OF THEM. Newer:musically dramatic or dramatically musical.Older:on the horizon.